Enjoy the nostalgic feel of a classic claw foot faucet. With an old fashion telephone style hand shower. Porcelain inlaid hand shower and temperature handles. Combo includes faucet, supply lines, shutoff valves and drain. In scale and in style, the Dartmoor collection of bath faucets and accessories is designed to delight. A gently flared spout is generously sized, adding beauty and function at the sink. Sculpted handles and finial detailing create a tailored look that's thoroughly classic. This trim kit requires MOEN valve 4792, 4793, 4794, 4796, 4797, or 4798 to complete installation. Featuring flowing curves, the Eva 4-Inch Centerset 2-Handle High-Arc Bathroom Faucet will add an upscale look to your bathroom for an air of grandeur. Boasting a beautiful oil-rubbed bronze finish that features light and dark accents, this faucet offers petal-like handles and a swan-like spout to bring a relaxed, luxurious feeling to your space. The 4-inch centerset design allows for easy installation. Combo Set 3-Handle Claw Foot Tub Faucet with Hand Shower in Oil Rubbed Bronze Enjoy the nostalgic feel of a classic claw foot faucet. With an old fashion telephone style hand shower. Porcelain inlaid hand shower and temperature handles. Combo includes faucet, supply lines, shutoff valves and drain. 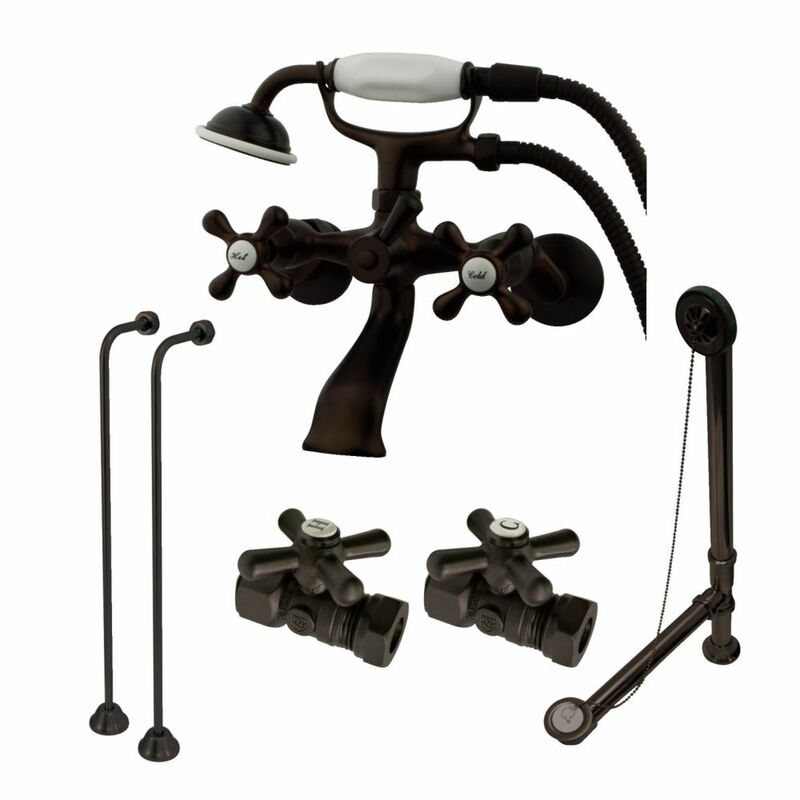 Combo Set 3-Handle Claw Foot Tub Faucet with Hand Shower in Oil Rubbed Bronze is rated 3.8 out of 5 by 4. Rated 5 out of 5 by Paula from The quality is great. Our contractor has not installed... The quality is great. Our contractor has not installed it yet due to other tradesmen needing to finish their respective areas first. Rated 2 out of 5 by Floyd from The parts did not work out well, did not fit... The parts did not work out well, did not fit our tub well and it’s sits very low in the tub. I wish we hadn’t purchased it. Rated 4 out of 5 by BethRVA from The spout sits extremely low. My plumber is going to... The spout sits extremely low. My plumber is going to try to rig something to make it work. I love the fixture but frustrated that it couldn’t be installed right out of box.